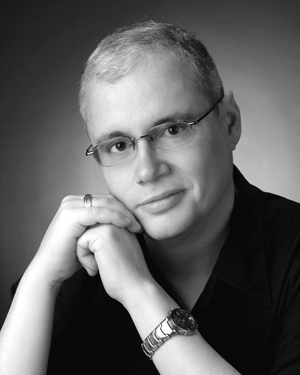 Rane Arroyo is a poet and playwright who was born in Chicago, a first generation Puerto Rican mainlander and a citizen who is also gay. He has published five poetry collections, one book of experimental fiction, and had eighteen plays produced and eight of them published. He has won the John Ciardi Poetry Prize, Gwendolyn Brooks Prize, Carl Sandburg Poetry Prize, Hart Crane Memorial Prize and many other awards. He started out as a performance artist in the crazy Chicago of the 1980's and is now a professor at the University of Toledo and also at Spalding University's Brief Residency MFA Program. Actually, there are two rooms! We converted a room into a library and it has antique French doors, stainglass windows, book shelve, cat tower, and a desk. It's also the room in which my partner and I often sit and talk about our day. I also write in my bedroom, my upstairs refuge. It shares the same view as the library room does. My cats love it when I write there for they think the sound of my computer keys are really music that I play for them, an electronic piano! In my bedroom, I'm surrounded by some of my paintings, book shelves with my Hardy Boys and Nancy Drew books that I bought for myself on becoming a full professor. I tend to mull on images noted. I've also had a complex life and often return to visit the ghosts. Many times I read poetry and I gain permission to explore something that I almost missed seeing. I do write everyday-drafts, exercises-or do some editing. It takes my poems a long time from no longer being "drafts" into being something almost finished. It's hard work to edit a poem 30-40 times and still try to sound spontaneous. I get ideas from TV, overheard conversations, everywhere. Some poems have needed research (such as my Ponce de León poems) while others have felt like crossword puzzles determined not to let me solve them. When did poetry come into the picture? 9th grade (during puberty, an accident?) . I was very smart but because I was a Latino in a new school, I was placed in the lowest level of English. I had a teacher who was ending her career and was just teaching what she loved. She taught us Emily Dickinson-and I realized that I always spoke in images, associations. English is my second language and so translating the world into words seemed natural. Also, even as a freshman I knew I wasn't going to be a rock star. You come from Chicago. Talk about your life growing up in Chicago. I actually lived in three Chicagos! The Chicago of my childhood was about living in a Spanish world and we rarely left our neighborhood to be where the English Speakers lived! We'd take rides but rarely stopped even in Grant Park. Gang activity inspired my parents to move to the western suburbs and suddenly I was spending my teenage years in a foreign world. Relatives form the city came to visit us, often with news and food as if we were exiles in Siberia. As a young man, I returned to Chicago, but this time I lived near the gay clubs, discovered art galleries and Chicago and I admitted our great love affair. My third Chicago is the one I know as a visitor, a prodigal son returned. My favorite memory is winning the Sandburg Prize on my birthday weekend, a prize named for the major figure in my dissertation. It was a moment when all my Chicagos merged, even if it took me years to return to be honored by the city I love. As a young artist, I became involved in the 1980's art scene: readings in parking lots and discos; exploring art gallery performance art based on biography; publishing in the small press. Chicago is my home, more than any other place even if I still feel like an exile. What writers do you read over and over? Which ones make you tick? I honestly read mostly poetry. I just reread all of Emily Dickinson's poetry, and now finishing James Galvin's astonishing collected poems, and just taught Yasunari Kawabata. The first major writers that changed my life (in chronological order): Emily Dickinson, James Baldwin, Jean Genet, Samuel Beckett, Wallace Stevens and James Schuyler. Who I now read constantly (in alpha order): Ai, Seamus Heaney, Czeslaw Miloscz, Pablo Neruda, Adrienne Rich, Yannis Ritsos, Sam Shepherd. I also love reading new poets-in magazines or online; the young African-American, Latino and working class poets are dazzling. I admire the poetry of people who are now valuable friends: Martha Collins, Jim Daniels, Debra Kang Dean, Luis Alberto Urrea, among many others. What do you try to teach your students (substitute reader or others) about writing? I tell my students that they are going to learn one thing and I will teach it to them in one minute. The rest of the semester is trying to figure out how to do this, argue with it, own it: specific is terrific. This doesn't mean you can't use abstracts, but how to use them well (Stevens! for example). I also ask them to define for themselves the differences between private writing and public writing: why are they seeking a readership? What are the cosmic implications of the personal and vice versa? Reading is central to my teaching of creative writing courses; this semester students had to write 8 imitation poems based on assigned 20th century poets. We read other people's work aloud, do mock translations from languages the students don't speak, and-if the class gets along-write parodies of each other's work. Often these last poems end up being tributes. My classroom is an intellectual safe space where risks must be taken. Any last comments you would like to add? I get more and more emails and letters from readers who have called me sly, clever, and even funny. I try to have fun with language, complicate pop culture fluency, and play with words. At several readings, I had to stop and tell the audience, "it's OK to laugh-please do." Richard Katrovas wrote me a book blurb that I value: "Rane Arroyo wears his politics on one sleeve, and his ample heart on the other, as did Neruda. Unlike the great Chilean poet, Arroyo has a wicked sense of humor…" How lovely to be wicked but not evil. I read books with great pleasure as a young boy; it's been my goal to create similar adventures for others. Talk about New Sins Press that you and Glenn Sheldon publish. New Sins Press is a publisher that welcomes new and established writers. The press is open to challenging ideas with emphases on inclusivity and craft. Past writers published through chapbook competition include: Barbara Hamby, Richard Collins, Exia, Amy Yanity, Julie Parson-Nesbitt, Diane Williams, Thomas Vaultonberg, etc. We are currently publishing full-length books in a time when words are dangerous.